It's been a long time, but I'm finally able to do a race recap for you and I'm super excited so let's get started! I've been really trying to get back into racing again, and so when I hear the Color Run would be coming to OKC we just had to sign up! 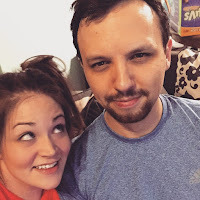 I invited my family to sign up with me as well and my sister-in-law, brother, and future sister-in-law (brother's fiancee) decided to sign up with Kevin and I.
Friday during the day I went to packet pickup. I'm happy to report the packet pickup was super seamless. I really liked how easy it was to pick up packets for my family so they didn't have to skip out on work. Sometimes picking up someone else's packet is a major hassle. After getting our packets, I checked out the little shop with Color Run merchandise and glow gear and so did Audrey. They had tons of neat stuff like light up wigs, high socks in neons, flashing sunglasses, water bottles, shirts, jackets, and even a cute stuffed unicorn. Audrey also got the unicorn which they called a RUNicorn. She is still cuddling it as we speak! 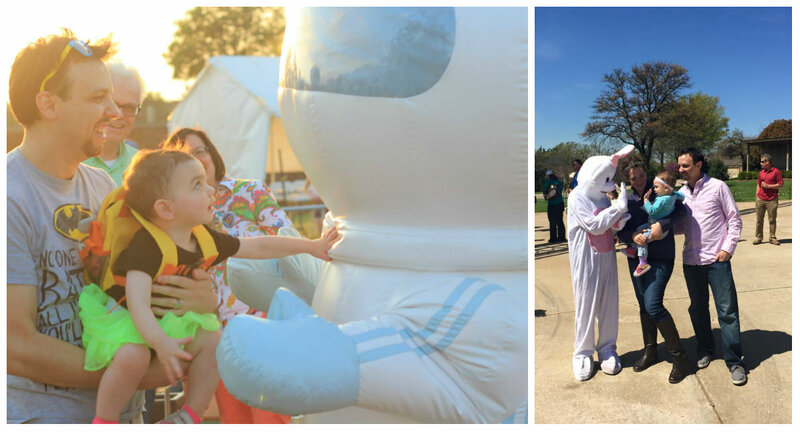 We decided not to bring Audrey along to this race, mostly because we didn't want to ruin the jogging stroller with colorful powder. So the day of the race we dropped off Audrey and headed to the race. There was a lot of photo taking before the race and a general atmosphere of fun. Quick note about wardrobe: Generally people fell into three camps: all white, all black, neons. The people in white glowed the most during the race, the people in black had the paint show up the best, and the people in neon looked fun. I think you can't really go wrong there. 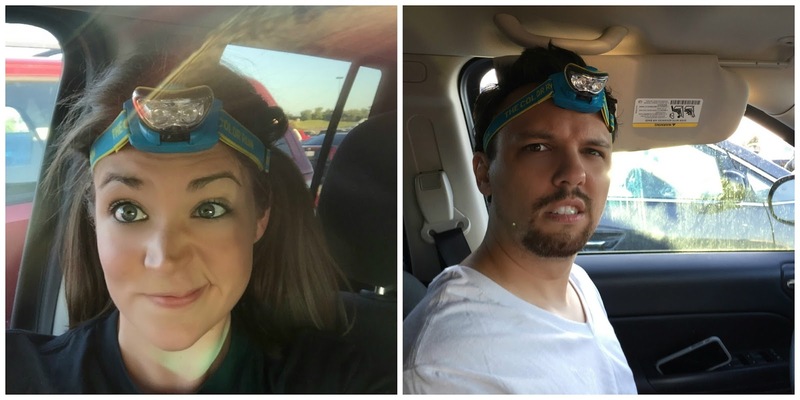 Also those headlamps look absolutely ridiculous and it's very hard to take each other seriously in them! For the size of the race I was a little surprised at how.... anti-climactic it felt. The repeating theme of the night, in my eyes, was a general feeling of waiting for something to happen that never did. When the race was starting there was no massive crowd rushing to the gates, there were a few loud moments when the dj played a good song, but there was a lot of quiet as well. It was also a little weird that the dj was clearly just using an ipod and searching for songs as he went. So like a song would end and he'd say on the mic "um let me find the next one" or "oops I already played that one". It felt unprofessional to me, but everyone was still having a good time. We of course took some more pre-race selfies! Soon it was time for the race to start. That's another one of those anti-climactic moments. There was no start gun or rush off. People just slowly and queitly walked through the start line. It was very odd. Kevin planned to actually run this race, so he took off from us a few minutes in and we didn't see him till the end. He literally finished the race in less than half the time it took us! haha. The rest of us were walking the race together. We ran every once in a while for a few minutes, but just tried to have fun walking. I didn't wear a GPS watch and there were no mile markes so I have no idea how far along things were, but my husband is really good at estimating distances and gave me his best guesses. The first mile had no color stops and was walking across the street and passed a lake. The larger races, such as this one, seem to attract a lot of newbie runners. I love to see newbies out on the course, however that does mean a LOT of traffic jams. If you are a walker at a race, especially in a big group, it's important to stick to one side and not to spread the entire width of the course. There was a lot of that going on so you didn't have any choice but to go at the pace of those around you. In our case it was VERY slow. We embraced it all the same! The first color spot came up right around 1 mile and there were 4 spots I believe within the next mile. Each color spot was marked by large neon arches and big sporting event style black lights. I have done Color Me Rad before and I was expecting big splashes of color coming out in clouds at these spots and lots of activity, but it was more like people sprinkling colorful powder out water bottles. It was very low energy. This was both a good thing and a bad thing. At Color Me Rad I had a very hard time with my asthma because there was SO much color in the air. Lots of people at that race complained of color in their mouths or eyes. That was definitely not a problem at this race, but it was also less intense and exciting of an experience. I heard "oh that's it?" a few times. After we passed the first few color spots there was a water stop. It was super crowded and the water was HOT, but they did a great job of keeping the course clear of litter from all the little cups. I'd also like to mention that they didn't have tons of cups lined up ready to go. They were pouring water (only 3 people pouring) as people were coming so that created a very big traffic jam. Later on there were two more arches that I thought would be color spots but weren't. The first of the two was an area with chalk drawings on the ground that glowed in the black light. Lots of people were stopping to get on the ground for photos. The second was a bit funnier. It was a bubble area and many people thought it was the end of the race, so they would sprint through the arch and then say "oh we have to keep going?". Finally we passed through the finish line. There was no clouds of color at the finish or crowds of people cheering. It was another awkwardly quiet part of the race that had me saying, "Oh that's it?". We recieved our medals and headed to the after party. I think the after party was where the race did really well. There was much more excitement in this area and we were among some of the last to finish, so my husband says it was even more fun earlier when the crowds were larger. Overall the race was fun, we had a great time as a family, but I am not sure it was worth the cost. I think maybe if you found a deal or discount it would be worth doing, but if you can't maybe not. I felt, for the size of the race and cost of the race, there should have been more professional touches like a real dj or more music and it would've created a much bigger sense of excitement. It wasn't a bad race by any means, but it left me wanting more and I felt it easily could've been done. 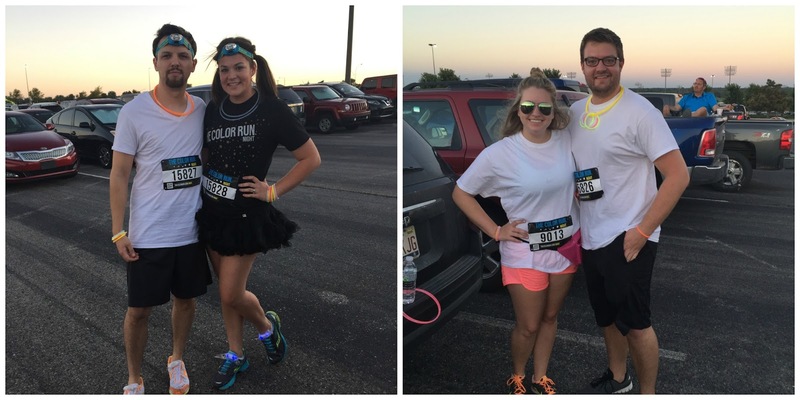 I hope that this recap was helpful to any of you considering doing the Color Run Night. QOTD: Have you ever been to a race and got the feeling "That was it?". What would you have done to improve it? I have been daydreaming about my daughter's first Disney trip since the day I found out I was pregnant. Disney World is my happy place and I cannot wait to show it off to her. We talked about going "one day" off and on for a long time, but finally started to plan a trip around the time she turned 1 last November. September 9th of this year, almost an entire year later, we will finally be making that first trip for her and I couldn't be more excited!! Audrey fell in love with big hotel beds! We really felt that testing out sleeping in a hotel room, figuring out how we could all be happy with an Audrey bedtime, traveling in a car, etc. would help us get the best idea of what a trip to the world would be like. We just drove to a town a couple hours away and then made a weekend of visiting their zoo and museums and special events. We learned a lot (Audrey loves hotel beds, we better have good reading material if we have to have lights out and quiet at 8:30, planning travel with nap times helps, etc) and it was a lot of fun for us to get out for a weekend getaway! I played lots of movies from Finding Nemo to Mickey Mouse Clubhouse to Mary Poppins. She loved them all! It's great because she now recognizes those characters and gets excited when she sees them. Whenever someone wears a mickey shirt or we pass a stuffed pooh bear we point it out to her and try to get her to say the name ("who is that Audrey?"). We also drew lots of characters for her with chalk outside while she played and talked about them. I'm hoping that when we go to Disney she will be able to watch a parade and get excited as she points out "Mermaid!" or "Mickey!". Toddlers love getting things right, so I think this will make it more fun for her. We watched them at a festival on a weekend trip and on the Fourth of July. Disney and fireworks go hand in hand and we wanted to see how she would like them. The first time she saw them she said "pretty" and seemed to like watching, but was afraid of the loud noises. The second time she just loved it all around. 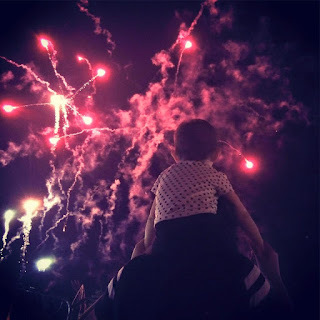 It helped her acclimate to them and it also taught me that we might want to choose a fireworks viewing location near a building in case the noises become too much for her. I'll talk about this more later on, but we tried to give her as many experiences like Disney that we could in our area. We have a small amusement park in our area, so we thought we would take her. They have mostly rides for taller people, but we tried to do as many diverse things as we could to see how she liked each. Going in we thought she would love the big swinging boat ride because at home she has no fear and loves to be swung around. There she actually hated it! haha. 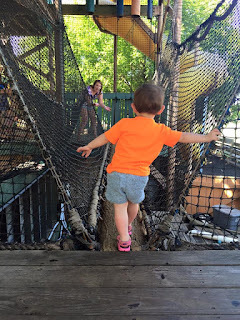 We learned that she will want time to run around after lots of time in line so we need to plan ahead to take time for playground such as those at the Dumbo waiting area or on Tom Sawyer's island. She wasn't the least bit afraid of the "scary" ride so we can also probably tackle Haunted Mansion. Overall she did awesome and learned sometimes we have to wait in lines. 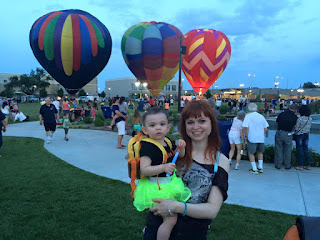 This was really more preparing us than her because we had to learn how we would navigate the crowds with a stroller and keep an eye on her when she was out of the stroller. Audrey seemed to handle the crowds just fine! 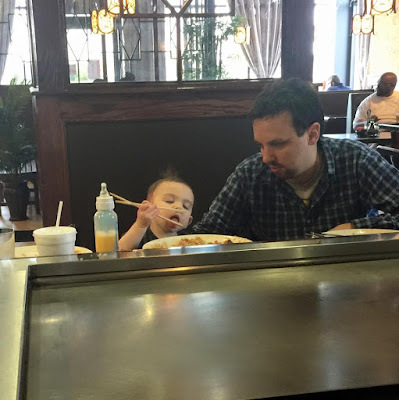 This gave Audrey the opportunity to try lots of different foods, which will come in handy when we are at different restaurants and my not have her favorite food options, as well as get her comfortable with eating with lots of distractions. In her gymboree class they play a game where the kids bang their hands on a big tube on the ground until the teacher yells "Freeze!". Then the kids are supposed to put their hands on their head and stop what they are doing. 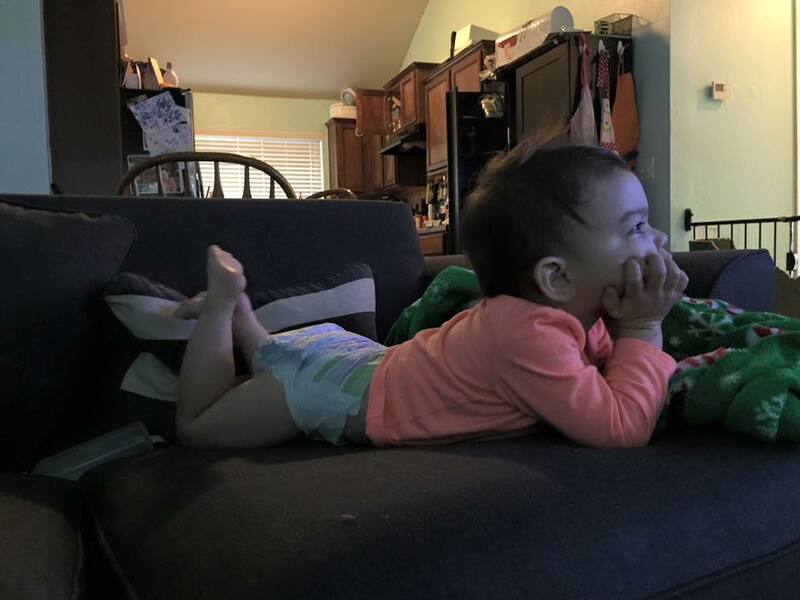 Audrey isn't quite two, so she's definitely not perfect at it, but making it a game helps. We used this a few times when she would start to stray from us too far and she would stop where she was. We worked on behaviors like "don't touch"
This will help a lot in gift shops and icky places around the world. Audrey isn't the biggest fan of characters, they tend to frighten her, so we tried getting her more comfortable around them. She's still not always up for it, so at least we are now prepared for the possibility she won't like it. Exercise is too harsh of a word, but we spent time walking a lot. 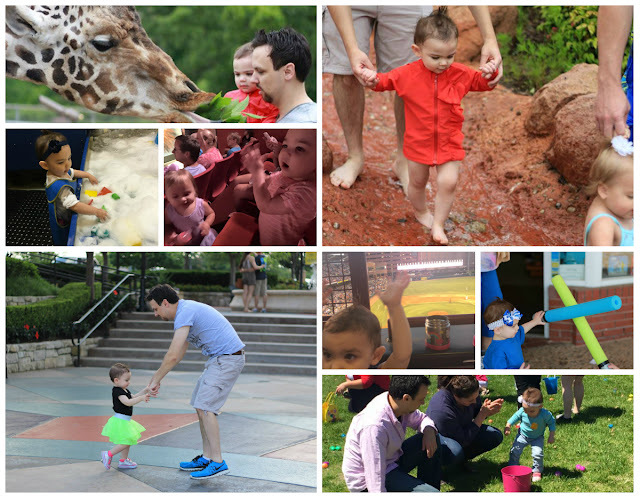 In the parks we plan to use a stroller but there are so many places you can't. We wanted her to be used to lots of walking so we generally let her walk if she wants to rather than force her in the stroller for the majority of our outings. Audrey loves to read. Like watching Disney movies, this was all about getting her familiar with the Disney world. I've slowly been growing a collection of small toys for her as they go on sale for the plane rides and bus rides to help keep her entertained. New toys always fascinate her longer than old favorites. She's a pro now, but it will be helpful when we get stuck behind afternoon parade traffic in the middle of a meltdown for nap time. We have a VERY stubborn and strong-willed little girl that never gets tired. I have tried really watching her and trying to determine what keeps her the happiest and willing to help out. I noticed that Audrey really likes having "jobs". If you tell her little tasks like "help mommy give the puppies water" or "hold onto your backpack and don't drop it!" she gets very proud of herself and will be much more cooperative. She likes to feel like a big girl, so letting her do things on her own may take a little longer, but in the end it will make for a day with a lot more smiles. That's just my daughter, but really taking the time to observe your child and what things you can do to keep them happier, especially in high stress environments as Disney can often be, will save you lots of heartache when you go. 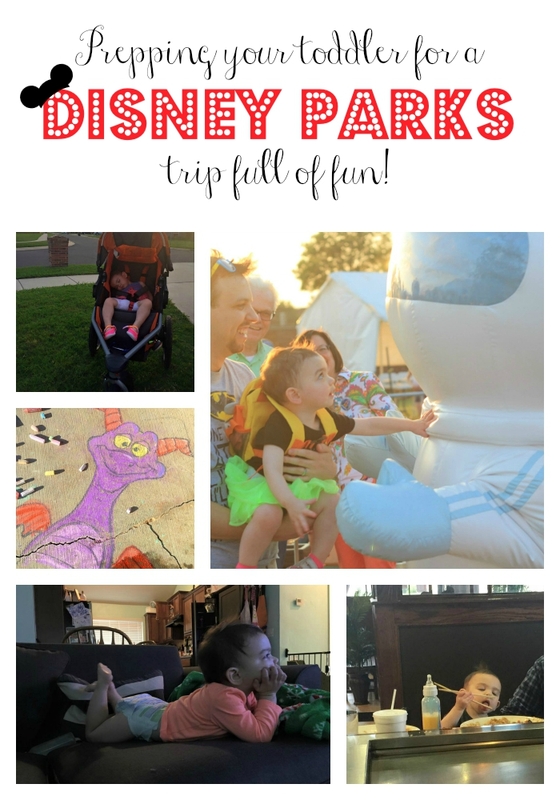 Those are just a handful of ideas that can help get your tot ready and excited for a Disney trip! If you have any great ideas, please post them in the comments! Way back before I became a runner, I remember listening to runners talk and being completely baffled by them. They said things like "ugh I'm so mad right now, I really need to get out and run" or "I went for a nice 6 mile jog and gained some perspective and now I think I know what decision I'm going to make". To them, running was therapy. I couldn't understand it. Running was torture. How could anyone think of anything but their lungs exploding or their legs falling off in a long run? But now it's 5 half marathons and countless 5ks later, and running has become my therapy. When I want to get out some frustration I hit the pavement. When I feel like all I can do is cry, I tie up my laces. When I'm overwhelmed and exhausted, I reach for my running skirt. Sure, running is still hard (and it always will be). My lungs DO feel like they are exploding and my legs DO feel like they will fall off. However, I can appreciate the peace of mind that comes from having no goal besides putting one foot in front of the other until I feel better. I love the boost of confidence that I feel after finishing a particularly hard training run or crossing a finish line. There is something about running that clears my head and helps me see the light at the end of the tunnel. Running is my sanity and I'm not sure how I ever got along without it. It's not even just my own therapy; It's my couple's counseling. Recently, my husband and I went through some hard times. Having a child before you are emotionally prepared is a really hard thing, and we both dealt with it in not very healthy ways. We both made her (and our extended families' wishes to see her) our sole priority in life so that every day felt like a twisted game of Tetris: fitting together the pieces of her busy schedule and demands,never bothering to put any pieces in for us. We never made ourselves, or our marriage, a priority. My self esteem suffered greatly and his happiness did too. It caused a lot of tension between the two of us to the point where we weren't always sure we would make it. The one light spot in some very hard days was running. 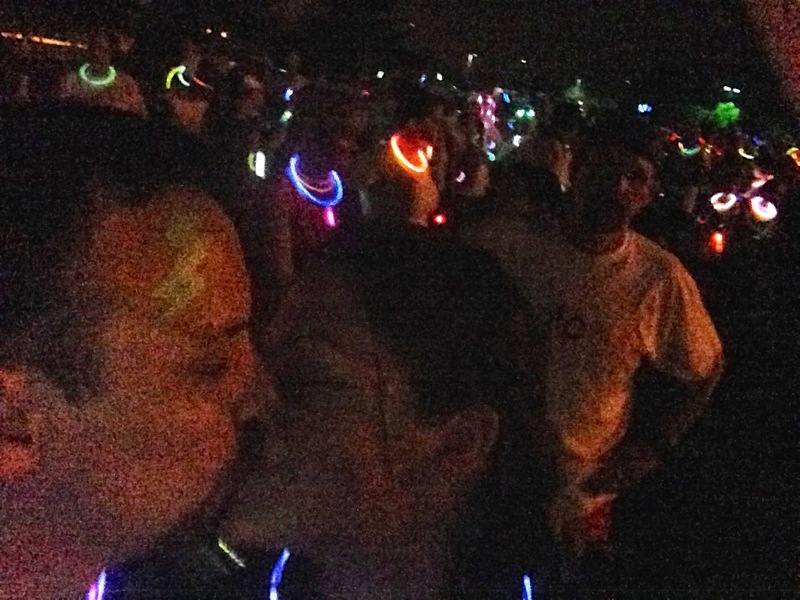 We both fell in love while running together, and it's absolutely fitting that running brought us back together again. 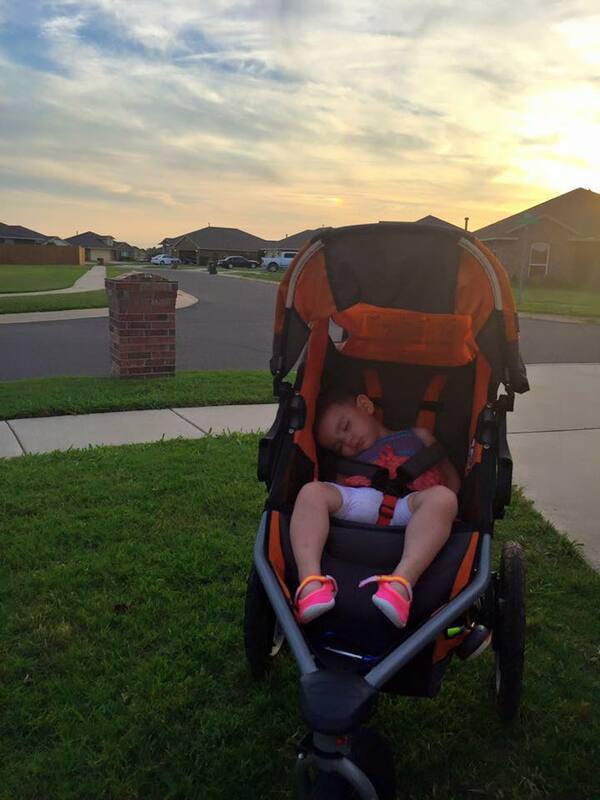 We both gave up on running during my pregnancy. I wasn't allowed to at times (my asthma couldn't be pushed that hard with baby on board) and it just wasn't a priority. After she arrived on the scene, I would try to run off and on and so would he, but the motivation to get started again and to find out how to fit in one more thing to our busy lives wasn't there. Finally when Kevin had a health scare about a month ago (he has always had heart problems and they flared up again), we got serious and started to do a mile or more every day. Slowly, running started to fix things. When we were struggling with anger, resentment, frustration, sadness, or all of the above we took it out on the road. Slowly running is giving me back my sense of self worth and the desire to make myself a priority again. I can visibly tell that running is making my husband feel happy again, and that's all I could hope for. Things are still hard for us at times (did we maybe miss the meeting where they teach you how to perfectly balance the million things on your plate and be good parents too?? ), but at the end of the day we are happy to have each other and in love. We started out by doing a mile together every night, but realized that it doesn't always work out for us with our busy schedules and our vastly different abilities (I wheeze my way through a 10 min mile and on a really good day, he does half a mile in 2.5 minutes on the regular). Sometimes it's better to run apart too. So, we do some runs together outside, some apart, some side by side on treadmills. When we run apart we have time to think and always come back to a situation with new perspective and a better attitude. When we run together we usually end up with smiles on our faces and flirting like teenagers again. No matter how you choose to incorporate running, or having a healthy lifestyle for that matter, into your life, I promise you that it will only make your life richer and happier. So thanks running for being the best therapist I could ever hope for. You have truly saved me more than once. Before my first half marathon, I had no idea what to expect to feel after a race of that distance, much less what I would need. Added on top of that was all of the additional needs of a trip to the parks. So, after doing several runDisney events, I've got my list of post-race essentials here for you today! First you need to know what a gear check bag is. Most long distance races (races over 10k) will offer a gear check. Basically this means you may leave some of the things you would want after your event with race volunteers at an organized booth so that you don't have to worry about your stuff while you run, but it's all there for you at the finish line. At runDisney events this is even more involved. You are given a large sturdy plastic bag (think extra large shopping bag, like toys r us) and a sticker with your bib number on it when you pick up your race packet at the expo. You can fill the bag with whatever odds and ends that you will want at the end of the race and make sure to put the bib number on your bag! (Sometimes the bib number is actually a tag you tie to the bag - either way it's for the same purpose). Before the start of your race you bring this bag to the gear check area and the volunteers will take it for you. At the end of your race, after you collect your medal you can go back to the tent (with your bib still on!) and collect your bag. No one goes in your bag so you are safe to leave things like a wallet. I wouldn't necessarily recommend that at other races, but I trust Disney! Always make sure you get the right bag. I've been at another race and accidentally been handed the wrong bag and it would've been bad if I hadn't noticed! So what should you pack in your runDisney gear check bag? I should mention that this is a list of items assuming you want to visit the parks after your race with no trip back to the room. I totally and completely understand if you want to go back and relax after, but I'm a person that likes to go, go, go! I think there is something extra magical about literally leaving the race and hopping onto a ride! No one likes being in sticky/stinky clothes all day after a race. Clean clothes are essential. Try to think about what would be comfortable if the worst happens in your race: chaffing! No clothes that would rub on those tough spots. If you can, pack lighter than you might normally. You don't want to be schlepping around tons of weight after running so much. These things are AWESOME. Nothing is as good as a real shower but a good wipe-down with these in a bathroom stall makes a huge difference. After Disney races they always have ice bags readily available to you and medics to tape you up if you need it, which I totally recommend taking advantage of if you need it. However, if you spend a long day in the park after you will need something after your first bag melts. These work great. I remember sitting at electric umbrella with my mom, both of us with our legs up in chairs icing our knees after our first race! The parks usually have pain reliever, but it costs much more than if you just bring your own. Ibuprofen (Advil) is bad for runners so stick to Tylenol. If you are doing a runDisney race right, you took tons of pics during your race. You will want to recharge your camera/phone so you can still capture memories of your post-race festivities. I love these! Some people like moleskin but these are my personal favorite. Whatever your preference, pack something to prepare for some nasty blisters. Because obviously. Haha. Even if it doesn't really help with the odor, it makes you feel cleaner somehow! If you are a human, you will be one sweaty hot mess after your race. Bring a headband, hat, or plan to braid your hair so you can get it in check. I don't know if it's just me but I'm always freezing after a race! Even on the warmest days I bring a sweatshirt for extra warmth. As a silly side note, Disney medals aren't super comfortable on your neck all day, a hoodie would really help with that! Good for lots of reason, but I like to stick my smelly clothes and shoes in them so they don't stink everything else up. Also great for putting ice in as an impromptu ice pack. I love the feeling of peeling off my shoes and socks and letting my feet breathe after a long race (gross? sorry?) and the last thing I want to do is put on sneakers. I recommend bringing some extra comfy sandals. Again, keep in mind that you may have blisters so try to wear ones that won't rub. I got these when I was pregnant and LOVE them. They are like memory foam for your feet! I feel naked without my mascara so I try to pack a small bag of makeup because nothing is left after that many miles! In case you are curious, after a Disney race we (my mom and I) have a little routine of what we like to do. We grab our medals and let our heart rate slow down a little. After that we watch runners finish and cheer on a few people. When we finally feel up to walking again we head into the park. The finish line is usually a 5 minute walk (even at turtle pace) from the park entrance. Once we are inside the park we find the lockers and rent one. In Epcot the lockers are very close to a bathroom, so we use that bathroom to wash up using the power wipes and everything from our gear check bag. We change into clean clothes and put all the smelly stuff and things we don't need in our locker so we have as little weight (and smell) as possible to carry around the park all day. Finally we head off for some fun in the park with our medals proudly around our neck! Hopefully this list will help you pack a great gear check bag! Even if you don't hop straight into the park, most of this stuff is good to have after anyways!